Since we are approaching the 4th of July I though I would share a brief biography of Abigail Adams. Abigail is considered by many people to be the First Feminist First Lady. The following quote from her is what inspired me to do some research. The following article gives use good glimpse into Abigail’s life. It was written by Bruce G. Kaufmann on October 30, 2013 and can be found at history lessons.net. Had there been a National Organization for Women in America in the late 18thCentury, Abigail Adams, the wife of our second president, John Adams, would have been a charter member. The woman who once admonished her husband to “remember the ladies” when considering legislation in the Continental Congress was a firm believer in women’s rights, and she lived a life that proved it. It was a life defined by the American Revolution, which, because its demands on her husband kept him away from home so often, only strengthened her independence, self sufficiency, and confidence that she was the equal of any man. It was Abigail who ran the family farm while John was in Congress or representing America abroad. That meant she was up before dawn, starting the fire, feeding the livestock, cooking the family meals and — because the war had shut down the schools — home schooling their children. It was Abigail who also managed the family finances, and probably did a better job than John would have done. Ignoring his advice to invest in land, for example, she bought public securities that eventually turned a fair profit. Yes, the times being what they were, a man (her uncle) had to execute those financial transactions, but it was Abigail who made the decisions — and kept a share of the profits. It was Abigail who also saw first-hand America at war, and did what she could to support it. In her native Massachusetts the fighting was pervasive, with American soldiers regularly afoot, and she often invited them into her home to rest and take a light meal. She even made musket balls for American rifles by melting pewter spoons in her fireplace. And then, late at night, her work done, she would sit down and write her husband one of her many letters — the correspondence between John and Abigail was voluminous and touched on a wide range of subjects. Abigail was a political junkie, constantly craving news of Congress’s activities and freely giving John political advice. And in her letters to John she also regularly complained about the lack of women’s rights, including a woman’s inability to hold political office (a complaint that, back then, must have astonished John!). In sum, she considered herself John’s equal partner, as proven by the fact that, years before she died, which she did this week (Oct. 28) in 1818, she wrote a will and testament, even though, technically speaking, she had nothing to bequeath because in those days all property in a marriage was legally the husband’s. Abigail didn’t care, and it was hardly a surprise that most all of her bequests in that will went to the women in her family. Now, if you are in the mood for further reading, I give you Alexandria Ocasio-Cortez who Abigail Adams would have been very proud of. She has never held elected office. She is still paying off her student loans. She is 28 years old. “Women like me aren’t supposed to run for office,” Alexandria Ocasio-Cortez said in a viral campaign video released last month. Mr. Crowley, who is twice Ms. Ocasio-Cortez’s age, is the No. 4 Democrat in the House of Representatives and had been favored to ascend to the speaker’s lectern if Democrats retook the lower chamber this fall. If Ms. Ocasio-Cortez defeats the Republican candidate, Anthony Pappas, in the predominantly Democratic district in November, she would dethrone Elise Stefanik, a Republican representative from Central New York, as the youngest person in Congress (Ms. Stefanik was 30 when she took office in 2015). The daughter of a Puerto Rican mother and a Bronx-born father, Ms. Ocasio-Cortez earned a degree in economics and international relations from Boston University but worked as a waitress and bartender after graduation to supplement her mother’s income as a house cleaner and bus driver, according to The Intercept. Her father, a small-business owner, had died three years earlier of cancer; after his death, her family fought foreclosure and her mother and grandmother eventually moved to Florida. She dabbled in establishment politics during college, working for Senator Edward M. Kennedy, Democrat of Massachusetts, on immigration issues, but soon turned her attention to the grass-roots work that would come to define her candidacy. She returned to national politics when she worked as an organizer for the 2016 presidential campaign of Senator Bernie Sanders, independent of Vermont. But even then, the idea of one day seeking office herself seemed unattainable. But if Ms. Ocasio-Cortez has, overnight, become the face of progressives’ hopes for ousting not only Republicans but also moderate Democrats who they see as insufficiently outraged about President Trump, her bid against Mr. Crowley predates the anti-Trump backlash that has fueled what many see as a “blue wave” across the country. She has joined activists in Flint, Mich., calling for safe drinking water, and traveled to the Mexican border this past weekend to protest family separations of migrants. Like Mr. Sanders, Ms. Ocasio-Cortez made her rejection of corporate donations and reliance on small donors a rallying cry for supporters; nearly 70 percent of her campaign funds came from individual contributions under $200. Before Tuesday’s victory catapulted her to the front of the political conversation, Ms. Ocasio-Cortez seemed to find readier audiences with outlets such as Elite Daily, Mic or Refinery29 — websites most often associated with millennial and female audiences — than with national publications. Still, shock seemed to be the predominant emotion at Ms. Ocasio-Cortez’s party on Tuesday. “Oh my God, oh my God,” she said as she realized she had won, her hands flying to her mouth and her eyes widening. Throughout the night, as more and more people flooded into the packed Bronx pool hall, Ms. Ocasio-Cortez was trailed by a swarm of reporters, supporters and campaign staff clamoring for hugs, selfies or just a glimpse of the woman behind a feat many had considered impossible. Follow Vivian Wang on Twitter: @vwang3. Shane Goldmacher and John Surico contributed reporting. Please feel free to add a link in the comment section to one of your posts about an inspiring woman. Two incredible women, centuries apart, daring to stand up and be counted! I was taken by Abigail Adams when I read The Midwife’s Revolt by Jodi Daynard … her strength, loyalty, intelligence and perseverance shone through. Exciting times in the Bronx and you can see the astonishment in Ms. Ocasio-Cortez’s face! When I learned about Ms. Ocasio-Cortez’s win, it renewed hope in my heart. Thanks Annika for being such a supporter of this Friday feature. I followed the news about Ms Ocasio-Cortez’s winning and I must say that the young lady’s’ boldness inspires. Thanks for introducing Abigail Adams. A strong woman, indeed, with much foresight. Unlimited power in the hands of men has currently set us on the path to our self-destruction as a species. Now, the men with power in our government are positioning to re-take control over female bodies. In doing so, they will have to deal with the young women of our times who are not the same as their mothers and grandmothers. Just ask Alexandria Ocasio-Cortez! Abigail and Alexandria you rock! I pray that the young woman hear the clarion call to action and take action that the freedom of choice is not taken from us. I had the pleasure of listening to a feature on Alexandria as I drove from here to not Eternity but rather Framingham this morning. She is one savvy lass and deserves all the praise and all the support this country (not just her electeted constituency) can afford her and more than some to spare. 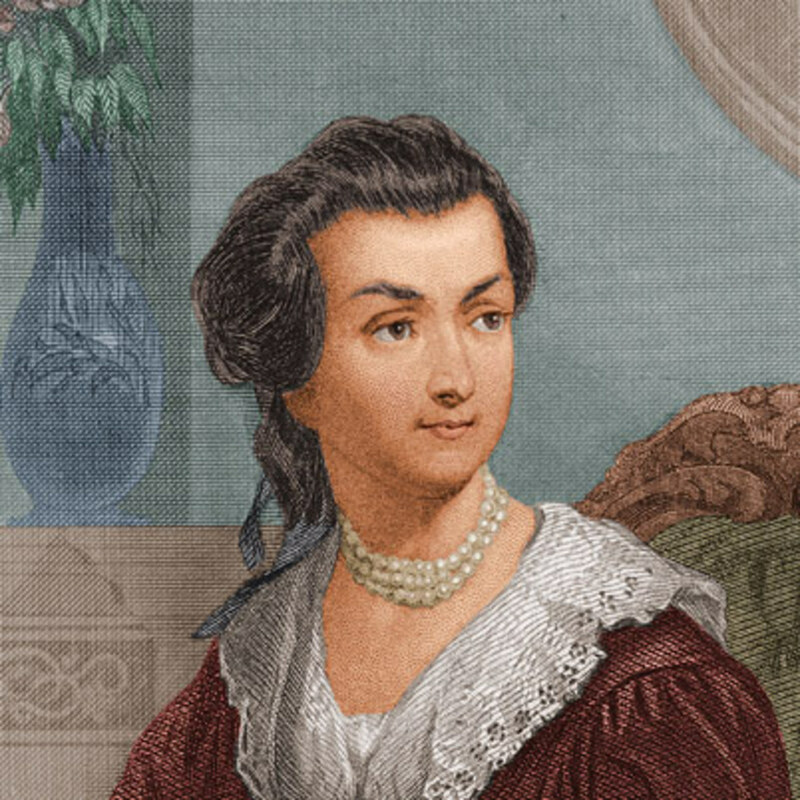 Abigail Adams I did not know much about and I am really grateful for this portrait of a true feminist … a woman who refused to allow her gender to stop her from being interested, interesting, engaged and engaging and who, were she alive now would be doing exactly what Ms Ocasio-Cortez is setting out to do. Representing the masses with fairness, being fearless in the face of bigotry and overturning the notion that more money means a greater chance. Yes, Medames you certainly DO rock and you, Bernadette do as well. Fiona, thanks for your reading and your support of me and for being a wonderful example of a feminist. Wonderful article about these two women with such strength and determination. Yes, Abigail would have liked the election of Alexandria from Bronx. What a fete! admiration. Her stunned face is something to remember.😊 . Thanks Miriam for always reading and commenting. Thanks Bette. Enjoy your weekend. It is so interesting reading these amazing women’s stories in your nations past & present Bernadette. Thank you for your continual support. Have a great weekend. Inspiring combination of women. 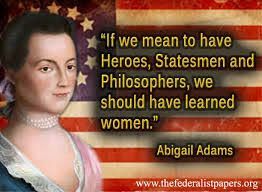 I especially enjoyed reading about Abigail Adams because, for all women, she was truly a pioneer. Yes she is a powerful example. A very informative post, Bernadette. Good to read about these women, especially as one is now.